ACM SIGGRAPH has announced the selection of Elliot Kotek, co-founder of Not Impossible Labs, as the keynote speaker at SIGGRAPH 2014, the 41st International Conference and Exhibition on Computer Graphics and Interactive Techniques, 10-14 August 2014 at the Vancouver Convention Centre. 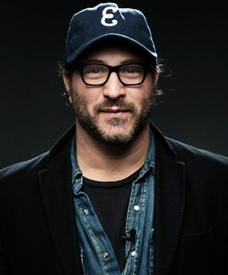 The current content chief and co-founder of Not Impossible Labs, and editor-in-chief of Not Impossible Now, Kotek is also the founder and editor-in-chief of Beyond Cinema and the former editor-in-chief of both Moving Pictures and Celebs.com. Not Impossible Labs is comprised of thinkers and doers with a mission to transform ideas that once seemed impossible to possible. By utilizing crowd-sourcing to crowd-solve healthcare issues, Not Impossible aims to provide low-cost and DIY solutions on an open-source platform, and to enable high-tech devices to reach people in need all over the world. Utilizing the content production strength of its founders, Not Impossible is disrupting the status quo of healthcare via compelling stories in which the one person helped inspires many to action. Not Impossible creates a sustainable cycle where collaboration inspires innovation, and where content compels further action. Eyewriter are eye-tracking glasses with free, open-source software that enabled a renowned graffiti artist paralyzed by ALS to draw and communicate using only his eyes. The technology was lauded in TIME’S “Top 50 Inventions of 2010,” named to Gizmodo’s Eight Incredible Health Innovations that Transform Lives, and became the subject of the award-winning documentary “Getting Up.” It also went on to win Gizmodo’s Health Invention of the Year. Hot off their win at the Cannes Lion Awards 2014 for Project Daniel: 3D Printing Prosthetic Arms for Children of War-torn Sudan, Not Impossible Labs was honored with a Cannes Titanium Lion, a Gold Lion in Product Design and a Bronze Lion in Branded Content & Entertainment. Other awards for Project Daniel include: Curator’s Recognition and the Next Cause Marketing award at AICP, two gold pencils at the One Show Awards (including tying for Best In Show for Design), a Silver Telly and a Bronze Telly, and the Maker Faire Editor’s Choice Blue Ribbon for creativity, ingenuity, and innovation. The Brainwriter is a personal EEG device, available for only $200, that operates a computer mouse or gaming console, and creates a seamless interface between brain and machine. Brainwriter will enable people suffering from any kind of neuromuscular syndrome to continue to write and draw as their condition worsens. EEG technology has been around for a while, and while there are already several companies creating personal brain-computer interfaces, they range in price from $800 to $2,000 and are not open-source. The Brainwriter is being launched as part of the Digital Revolution Exhibition at Barbican in London on 3 July 2014. A former M&A/Biotech Venture Capital attorney in Australia and New York, Kotek holds a Law Degree, a BS in Pharmacology & Toxicology, studied at The Lee Strasberg Theatre Institute and completed UCLA’s Professional Program in Screenwriting. He’s become a recognizable figure in taking stories based in the sphere of science and technology, and ensuring that they are not only accessible, but that they serve to inspire. The feature documentary “140,” which Elliot co-produced is the first feature ever user-generated film made utilizing social-media. “Little Larry,” which Elliot wrote, received a Directors Guild of Canada nomination, and his current productions include the documentaries “Queen Mimi” with Zach Galifianakis and “The People Sign,” which highlights the work of music interpreters for the hearing impaired. SIGGRAPH 2014 will bring thousands of computer graphics and interactive technology professionals from six continents to Vancouver for the industry’s most respected technical and creative programs focusing on research, science, art, animation, music, gaming, interactivity, education, and the web from Sunday, 10 August through Thursday, 14 August 2014 at the Vancouver Convention Centre. SIGGRAPH 2014 includes a three-day exhibition of products and services from the computer graphics and interactive marketplace from 12-14 August 2014. More details are available at the SIGGRAPH 2014 website or on Facebook and Twitter. This entry was posted on Wednesday, June 25th, 2014 at 7:48 am and is filed under Animation, Associations, Audio, Careers, CGFX, Digital Products, Education, Events, Game Dev, National News, Peripherals, Research Studies, Software, Studios. You can follow any responses to this entry through the RSS 2.0 feed. You can leave a response, or trackback from your own site.